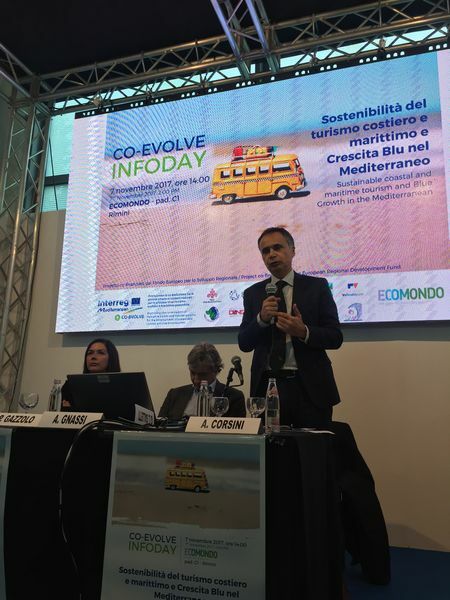 The project’s first information day gathering local, regional, national and Mediterranean stakeholders took place in Rimini on 7 November, in the frame of the ECOMONDO set of events. The CPMR Intermediterranean Commission -together with Emilia-Romagna Region (RER), the Region of East Macedonia and Thrace (REMTH) and CNR-ISMAR- co-organised an information day on “sustainable maritime and coastal tourism and Blue Growth in the Mediterranean” in relation to the CO-EVOLVE project. This meeting was the occasion to exchange on ongoing initiatives related to the aforementioned issues and raise awareness on the project among local, regional, national and international stakeholders active in these areas. The meeting was introduced by political representatives from the area, namely Andrea Corsini and Paola Gazzolo, from RER’s regional government, and Andrea Gnassi, Mayor of Rimini. They all highlighted the specificities of their territory with regard to tourism, and stressed the importance of protecting coastal areas while unleashing the potential of Blue Growth. “Our goal is to ensure a sustainable coast, attractive for aware investors: a safe coastal territory where its full environmental, landscape, economic, touristic and recreational enjoyment can be widely available. This is the key to deliver the blue economy in a more concrete way”, Ms Paola Gazzolo, Regional Minister for Soil and Coast protection and Environment of the Emilia-Romagna Region said. “In order to achieve a real sustainable management of tourism, we should look to a more aware (or “informed”) use of resources, from the territory, as well as to smart beaches, alternative energy and the water cycle. We need to translate all this into specific indications and policies for tourism structures so that they can adopt sustainable ways to use these resources”, Mr. Andrea Corsini, Regional Minister for Tourism and Commerce of Emilia-Romagna Region stated. “Rimini will no longer drain greywaters into the sea”, Mr Gnassi declared, pinpointing the disastrous consequences of discharge in the Mediterranean. The opening was followed by a first Thematic session “strategies and initiative on sustainable tourism in the Mediterranean” gathering representatives from public administrations, higher education and organisations involved and/or following key initiatives in the Mediterranean. Several key initiatives, programmes and projects related to Blue Growth and sustainable tourism were presented. Programmes and projects included the Interreg MED Programme and related Axis 4 PANORAMED project on Governance (which Work Package 5 is dedicated to Maritime and Coastal tourism); the BleuTourMed project and its MED ‘Sustainable Tourism’ community made of all 3.1 Modular projects and associated stakeholders; as well as the Interreg MED MITOMED+ and BlueIslands projects, which are part of the MED ‘Sustainable Tourism’ community. On this occasion, the CPMR Intermediterranean Commission, listed some of the ongoing initiatives related to sustainable tourism and Blue Growth in the MED, including the Union for the Mediterranean (UfM) work on Blue Economy; the EU WestMED and the Bologna Charter. Other speakers presented the EUSAIR Strategy (representative from Puglia Region, in charge of the coordination group of Pillar 4 on sustainable tourism) and the BLUEMED initiative (Director of Ciset of Cà Foscari University, BLUEMED’s Pivot of the national Platform “Economy”). 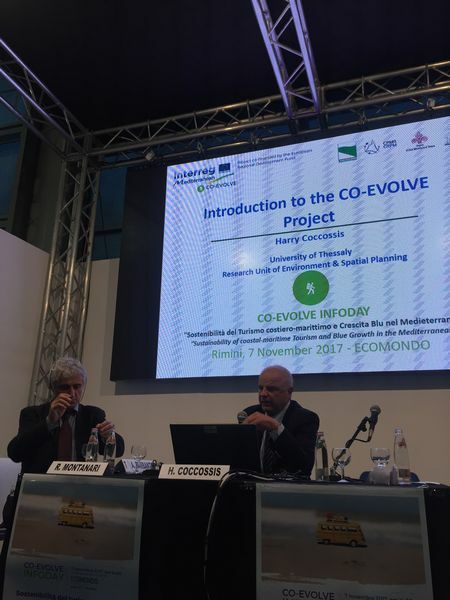 Session II focused on the CO-EVOLVE project and its last developments. Partners attending the meeting recalled the overall objective of the project and presented ongoing and foreseen actions. Studying and testing activities were presented by CNR-ISMAR, University of Thessaly and RER respectively. Activities carried it in the project’s pilot areas -especially Cattolica/Comacchio and Maki-Alexandroupoli/Keramoti-Thassos areas. Other CO-VOLVE Infodays will be organises in Greece, France, Spain and Croatia in the coming months.